This past Friday was Crazy Hair Day at my daughter's school. My daughter was super excited about it, and kept asking what she was going to do. My first thought was to put a bunch of barrettes in her hair, but we ended up deciding on color instead. 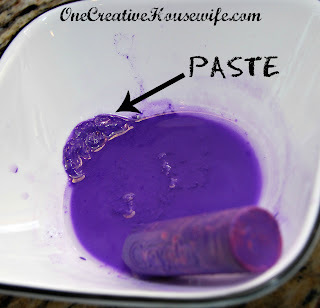 I didn't have any of the spray hair color stuff, so we went to plan B.
I came across this idea on a pet grooming blog. This is a super simple idea to pull off at the last minute for a Halloween or costume party you end up attending at the last minute. 1. Place some water in a bowl and allow the chalk to soak for 5-10 minutes. 5. Allow hair to dry. 6. Spray hair with hair spray. 7. Allow hairspray to dry. 8. Tip head upside down and lightly scrunch hair to knock out the excess chalk. 9. Repeat steps 6, 7 & 8 if necessary. 10. Finish with a coating of hairspray. This is my daughter's hair before I sent her out the door to school. All day I stressed over what kind of mess her hair was making, and how much her teachers were going to hate me...LOL. 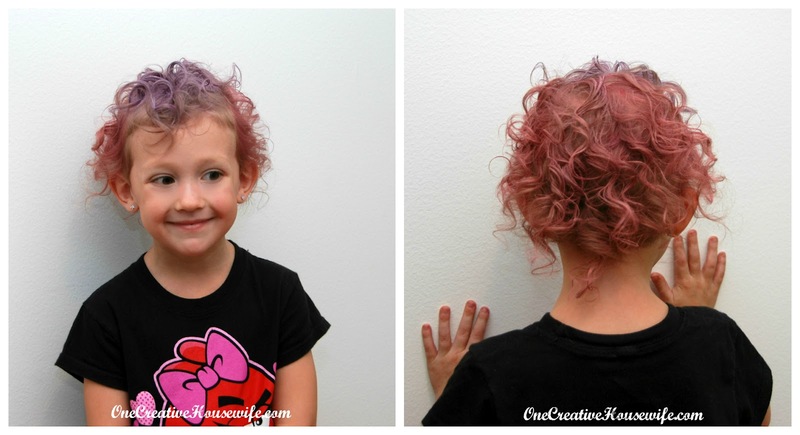 As soon as she walked out of the school, and I could pick her out by her hair color I knew this idea was a success! This was her hair after school. Don't you just love how I can almost never get her to look at the camera?!?! Apparently I have traumatized her over the years with all my picture taking or something..LOL! Clean up was a snap! It all washed out in 1 shampooing. This is an idea that I will definitely use again! 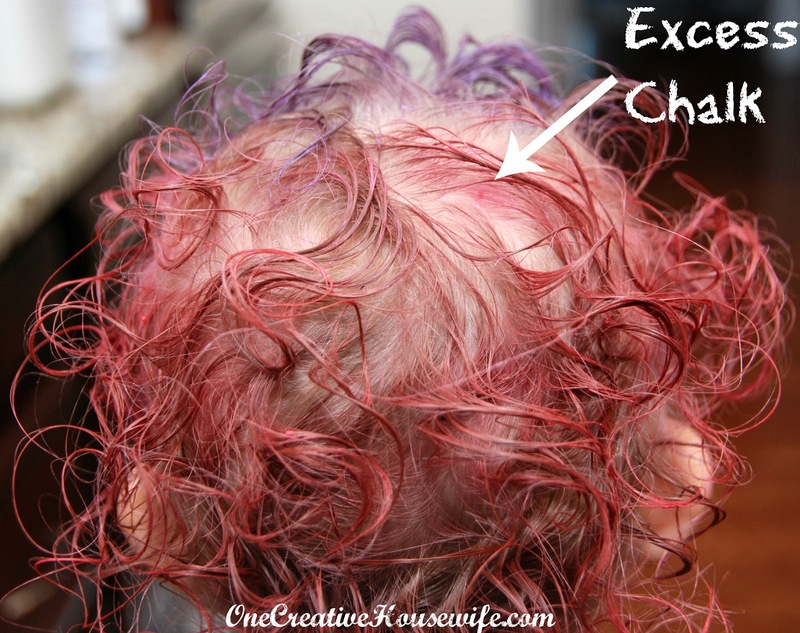 It was easy to do, easy to clean-up, and I won't have a ton of different cans of hair color sitting around year to year. Oh that's so cool, I've seen it before but wondered if it would work :) looks crazy cool! Thanks! Is is super easy too!!! Love it! How did you apply it to her hair? Did you just scoop it out in blobs and run it through or did you use a brush/comb or tool of some sort? This might solve my Rainbow Dash problem for my daughter for Halloween. I can't justify spedning $30 on a wig and the colored hairspray is going to be expensive too. I just used my fingers to run it through my daughter's hair. As you can see my daughter's hair is super fine so it wasn't an issue for me to get it on all her hairs. 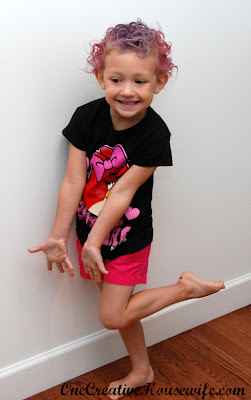 If your daughter's hair is thicker you may need a wide tooth comb, but make sure it is wide tooth. A fine tooth comb may remove too much of the chalk as you try to comb it through. Happy Halloween I hope your daughter has a great time! I have dark brown hair and the yellow just kind of looked white, but the pink and purple were fine. 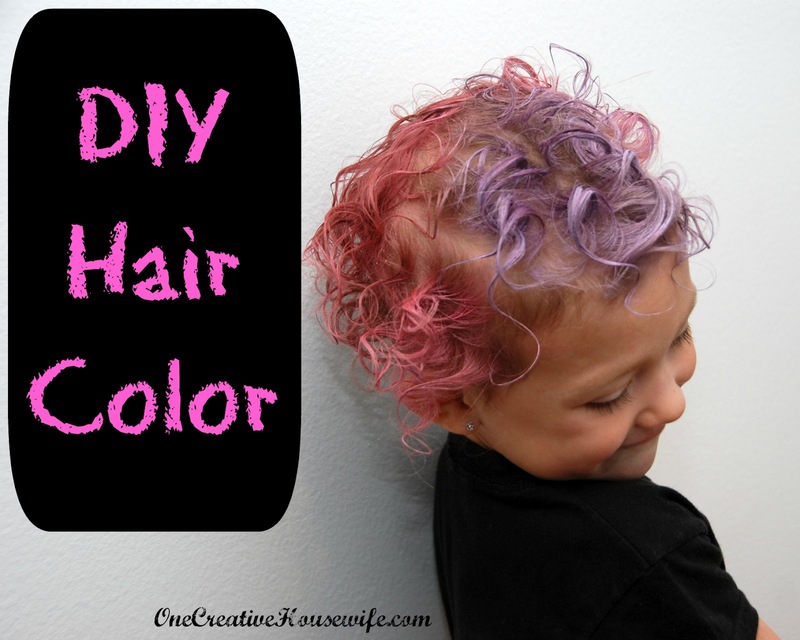 I have just found out it is crazy hair day at school on Friday and I do not have the funds to buy coloured hair spray, my Google search of "DIY crazy hair colour" gave me your blog. This is an excellent idea and I will be trying it on Friday. Wish me luck.